The city of Hoi An is a real gem in central Vietnam. It was lucky enough not to have been affected by war and has remained intact for centuries. It was also fortunate to see its port silt up, which slowed its development, allowing Da Nang to become the fourth largest city in Vietnam. Over the 7 years that I have been living in Hoi An, I have been able to discover a myriad of places, which I’ll discuss below. You won’t find any of them in the likes of the Routard or Lonely Planet travel guides. It certainly stands out due to its 844 UNESCO-classified buildings, with its yellow walls, Ying Yang tiles and houses made out of jackfruit wood. The city has not suffered from the horrors of war. Walking around this city is a real treat along with its unique architecture showcasing both its Chinese and Japanese influences. It is an open-air museum. There is also a former French Quarter (Rue Phan Boi Chau) where you can see the French influence on the design of the buildings there. The city is pedestrianised and free. You only need to pay the admission fees to enter the museums and the old houses. To visit them, you can buy a 5-ticket pass, which costs 120,000 VND. If you are looking for a French-speaking guide, have a look at visite-guidee-hoian.com. 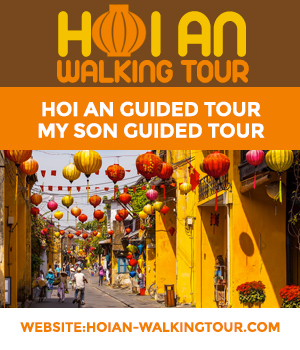 Maybe, a local guide will help you discover Hoi An. Every month in Hoi An, there is the Full Moon festival. During this time, the electricity is cut off in the city, which is then lit up with lanterns. There are also several activities such as folk songs, dance and traditional games. 2 – Located 3km from Hoi An, the ecological village TRA QUE (pronounced Tcha wé) is an exceptional and timeless place. You can learn how they cultivated plants back in the good old days by carrying these double watering cans for yourself. The village grows more than 20 different types of vegetables, which are sold to the best restaurants Hoi An has to offer. You have the opportunity to learn a little more about the vegetables grown there as well see a slice of Vietnamese life. You can rent a boat for 100,000 VND and go down the river. There is no office where you buy tickets here. All you have to do is ask a fisherman on site. It’s definitely worth it. At Tra Que, you will also see Hoi An’s most famous couple. Better to come early in the morning to see the gardeners at work between 6am and 7am. The village is surrounded by rice fields and you can easily get around by bike. 3 – CAM KIM ISLAND is a unique place. Few tourists go here, so the island doesn’t feel too touristy and remains authentic. You are more likely to bump into a buffalo than a tourist or car. The island can be accessed by a bridge and is located 500m from Hoi An. This is my favourite place in Hoi An because the place is not overflowing with tourists. You can visit the Kim Bong carpentry village, which contains many artisans such as mat weavers, Vietnamese round boat makers, Mi Quang noodle manufacturers (a Hoi An regional dish) as well as fantastic views of rice fields and buffaloes. There is also the fishing village of Tra Nhieu, one of the most famous villages in Hoi An. 4 – Located 1 hour and 30 minutes from Hoi An, THE MY SON SANCTUARY is not really comparable to Angkor and if you have already visited the aforementioned temple, you may end up being disappointed. Otherwise, this UNESCO-classified sanctuary really is an exceptional place. The Cham sanctuary is in the middle of a forest which gives it a striking atmosphere. There are also Cham dance performances in the morning. It costs 150,000 VND per adult to enter but I highly recommend you take a guide (100,000 VND – ask at My Son reception) to fully appreciate the place. 5 – THE CHAM ISLANDS are exclusively for diving and snorkelling. To be honest, even though you can visit the island, it is a bit disappointing since the island is split in 2 because of an on-site military base. It is also difficult to get around because the roads are impassable. 2 diving schools can be found in Hoi An: Cham Diving and Blue Coral. It also boasts several on-site activities such as barbecues on the beach. 5 – CUA DAI AND AN BANG BEACHES for relaxation and you will almost be eating on the waterfront. I’d go for An Bang Beach since Cua Dai Beach has been damaged by erosion and has lost a lot of its beauty. In An Bang, there are several restaurants to grab a bite to eat including the Soul Kitchen, which puts on live music at night. For larger budgets, you can go to the Hmong Sisters restaurant where you can eat really well. Located between Cua Dai and An Bang, Hoi An’s Hidden Beach is on the recommendation list for its tranquillity even though it is developing at a fast pace. Leaving Hoi An, the Cam Thanh area is ideal if you want to go on a cycling excursion. The place has developed a little too much for my liking but by leaving the main streets and strolling along these smaller ones, you will discover Hoi An’s calm and exceptional side. Here, they grow and work on coconut leaves and you can find them everywhere. This is where you can go basket-boating. Take a tour on these famous round fishing boats in the midst of the seven hectare water woods scattered with submerged coconut trees (almost unique to Vietnam although they can also be found in the Mekong Delta). A one-hour ride in a basket boat will set you back 100,000 VND. 7 – THE PRECIOUS HERITAGE MUSEUM is a museum, opened by French photographer Réhahn (cocorico) but it is, for the most part, a museum where you can see most of the original costumes of Vietnam’s 54 ethnic groups. It’s also possible to see different ethnic accessories like earrings. You can also sample coffee from the Co Tu minority. It is also a photo gallery where you can see Hoi An’s sublime side. Although I had already visited Hanoi’s Ethnological Museum, I found this museum to be superb, especially as the costumes are not exhibited in glass cases, which allows you to really see them. The museum is free and in French. 8 –PRAO VILLAGE is a village, which is 2 hours and 30 minutes away from Hoi An. Why should you go here? Quite simply because you will discover the Cotu, the ethnic minorities of central Vietnam. The place is authentic and you can see the traditional costumes and the town hall in the middle of the village. Avoid Nam Hang which is the village for tourists. 9 – THE HOI AN MARKET totally immerses you into local life where you can eat delicious cuisine that Hoi An is known for, including the Cao Lau for a ridiculously low price. There is also the excellent Banh Xeo (Vietnamese Crepe), much better than lots of restaurants in Hoi An. You have to go there early in the morning and have lunch with the Vietnamese to really appreciate this place. 10 – THE THANH HA POTTERY VILLAGE is, as its name suggests, a pottery village. You can see all different kinds of pottery designs there. You’ll also have the chance to try it out because with your entry ticket, you will be able to create make your own. The village has recently welcomed a huge park. You can also learn a little more about pottery. You should also know that the village has contributed to pottery found all over Hoi An. Admission is 35,000 VND per adult. I’ll also add Da Nang, which is only 30km away, to the list.